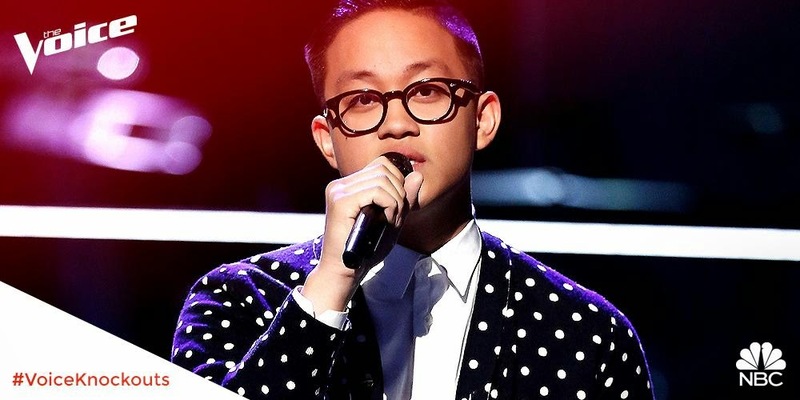 NAGA CITY--Camarines Sur's pride Nathan Hermida breezed through the knockout round on The Voice US Monday night. This gets him a spot on the live playoffs on the NBC reality show. The unassuming 17-year-old from the towns of Nabua and Baao captivated the judges with his effortless rendition Leave your Lover. Coach Blake Shelton was all praises for Nathan's falsetto. He exclaimed that Nathan "sang a duet with himself!" "Switching back and forth from that falsetto was cool...And you can't go wrong," he added. Meanwhile, Christina Aguilera admired Nathan's great effort in singing a difficult song and his "courageousness." But, the pop singer also noted some pitch issues. Agreeing with Aguilera, Coach Pharrell Williams said that Nathan's piece is a difficult song to sing. and that Nathan was able to prove his worthiness to remain in the competition. Nathan's coach Maroon 5 singer Adam Levine also remarked that the contestant finally opened up to the audience during his performance. In the end, the Bicolano was picked by his mentor over the more experienced singer Clinton Washington. Nathan's interpretation of Sam Smith's song is now available on tw.itunes.com/LeaveYourLover . You may catch his performance at 7:40 tonight on AXN . BICOLSTANDARD.COM Pirming enot. Pirming bago.